Archbishop Murphy died on the morning of June 26, 1997. Below is a chronology and some personal reflections on his last months. I encourage you to remember the soul of Archbishop Murphy in your prayers and to pray for the Archdiocese of Seattle during this time of transition. 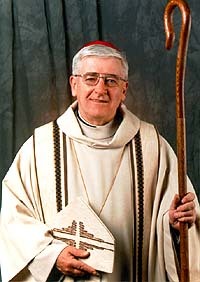 On December 1, 1996, Archbishop Thomas Murphy was diagnosed with leukemia. This was complicated by a kidney problem. He has been undergoing chemotherapy and is responding well to the treatment. I would like to thank the many people who sent e-mail messages. The Archbishop is responding beautifully to the treatment. However, his disease is serious and he continues to need your prayers. At our priest retreat this past week we had a happy surprise. Archbishop Murphy visited us on Monday evening. It was wonderful to see him. Although showing the effect of the grueling chemotherapy, he was cheerful, upbeat and anxious to dive back into his work as chief shepherd of the Archdiocese. Next Monday evening, Feb 10, in St. James Cathedral, Archbishop Murphy will lead a service for the World Day of the Sick. February 10 is eve of the feast day of Our Lady of Lourdes, an appearance of the Blessed Virgin Mary, which has a special significance for the sick since there are often miraculous healings at that site. Last week Archbishop Murphy gave a powerful witness for life and a challenge to the culture of death. At the Monday evening Mass for the World Day for the Sick, he spoke about his own life threatening illness. Having cancer has made him reflect on our society's call for "doctor assisted suicide." Those who want it legalized say assisted suicide will protect the dying from what they fear most: intractable pain, loss of control and dignity and financial stress. Yet, said the Archbishop, "assisted suicide is not compassion. True compassion is willingness to share the pain of others, be present and learn from them." It was a powerful statement and a challenge to all of us. More and more we are going to be asked to accompany the dying, but always respect life as a gift from God, from the moment of conception to natural death. Archbishop Murphy also gave guidance on what it means for us to be stewards of the gift of life. He explained some of the criteria he himself is using to make difficult decisions. We do not have to accept every medical treatment, but choose the ones that offer a reasonable hope of benefit and do not impose an excessive burden on oneself and others. There is a huge difference between responsible stewardship and the deliberate taking of a human life--even ones own. Information on Assisted Suicide and other Right to Life Issues. Archbishop Murphy has been most active during this past Lent. I have seen him at a number of Archdiocesan services and gatherings for priests. It is a joy to see him so active and upbeat. He is grateful for prayers and continues to ask for them. 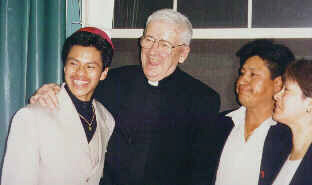 Archbishop Murphy with Luis Castañeda after confirmation, May 8, 1997, Holy Family. Proud parents, Gumercindo and Irma Castañeda look on. On Thurday, May 8, Archbishop Murphy was in Holy Family Parish for the confirmation of 45 of our youth. He had been in Chicago the previous day for Archbishop Francis George's Installation. The next day he conducted a memorial service for Bishop Walsh, then came to Holy Family in evening for the Confirmation ceremony. All this was on top of his administrative duties, so one would expect him to be tired. Just the opposite. He conducted the service with great dynamism and gave a powerful homily. He mentioned his own experience of having been diagnosed with leukemia and told he had just three days to live. He of course did not die, but spent 39 days in the hospital. He said those were the longest of his life, comparing them to Friday afternoon classes. He encouraged the young people to be grateful for the gift of life, to say "Thank you, Gracias." He mentioned his own gratitude and prayers for those who donate the blood which he receives every three weeks or so. Also he told us his nurses are members of Holy Family Parish. After the Confirmation he attended the reception and as always showed his great gift for communicating with young people. Please continue your prayers that God will give Archbishop Murphy many more months and years of life and service. At our annual Priests' Days at Ocean Shores, Archbishop Murphy gave us a report on his health. While there are some encouraging signs, there has not been a remission. He asked our continued prayers. Then he told us about what happened some eleven days after he was hospitalized. He was unconscious, in a virtual coma, and his brother and sister were discussing with the doctors possible funeral plans. The Archbishop, according to what they told him afterwards, lifted himself from the bed, put a blanket around his shoulders, went out to the hall and stood next to them. "What are you doing?" they asked. He said, "Don't you see her?" They said there was no one there but them and the doctor. The Archbishop then continued, "Don't you hear the children? They are praying. They are saying the rosary." It was at that point that the Archbishop began to regain his strength. As you can imagine, this experience deepened his devotion to the Blessed Virgin Mary. And made us all reflect on the role of Mary in our lives as priests. I was struck by the fact that it happened precisely when those in the Hispanic community were praying the novena to Our Lady of Guadalupe. Those prayers, together with those of thousands of other people have sustained Archbishop Murphy during these past six monthes.